Over the time, we have accumulated reasonable amount of Joomla FAQs that we decide to give it a decent home. 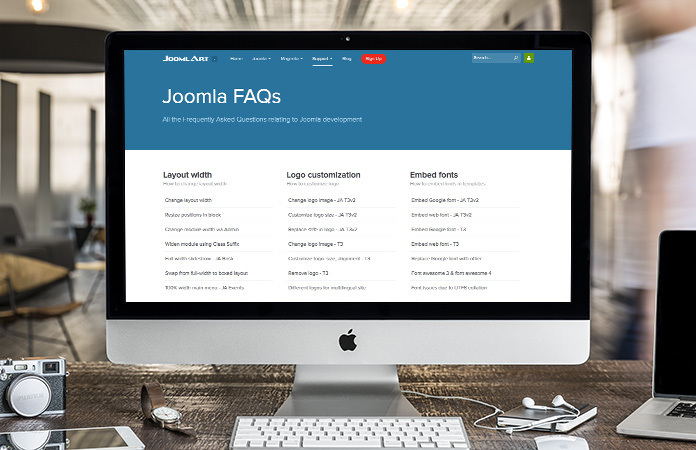 And today we are happy to introduce to you for the very first time our Joomla Support FAQs page. Layout width: including layout width, menu width, slideshow width, etc. Copyright removal: showing you how to update template footer copyright info. Remember that this FAQs page is a work in progress. We'll be adding more in the upcoming time, so don't you worry! If you have any specific request or feedback as well as suggestions, feel free to drop us a line in the comment section below. We're always here, listening and open for all of your feedback. Look forward to hearing how we can help with the new FAQs page in the comments section!